If you’re a fan of green tea, you can’t miss this post. If you're a fan of both green tea and mochi, this post is exactly written for you. If you aren’t into these two things, the beautiful pictures on this post might get you thinking that if not give these green tea mochi cupcakes a go, you might feel missing something in your food adventures. Ann’s food photos are always very inspiring and attractive to me. Her recipes on her blog, Pig Pig’s Corner are simple and delicious, great for homecooks. 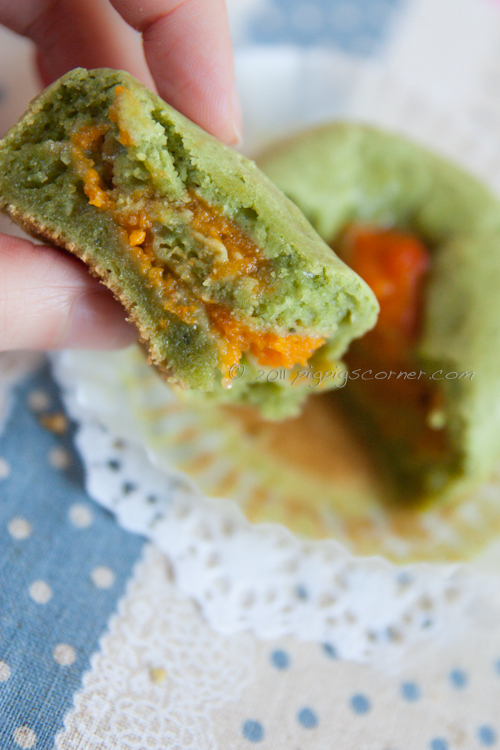 Do hop over to her blog and browse her Green Tea Butter Cookies and Matcha Green Tea Ice-cream, you’ll know I have found the right person to do this guest post. Thank you so much, Ann, I feel honoured to have you do guest post for me. Christine's Recipes is one the blogs that I follow religiously as her blog seems to remind me of those Hong Kong cooking tv show that I used to watch. She also runs a Chinese version 簡易食譜 which means "easy recipes" in Chinese and that's what her blog is all about - simple,homey dishes. I was a little worried (and happy of course) when Christine asked me to appear as a guest writer on her blog. Have you seen her super long recipe index?! I was just about to ask what has she not cooked and blogged about. Luckily, she suggested a green tea dessert for her blog. So here I am today, featuring my current obsession - mochi cupcakes. at the same time. Hmm...maybe more like the texture of a chewy fudgy brownie. If you are not familliar with mochi, it is a type of Japanese rice cake made of glutinous rice pounded into a paste and then molded into the desired shapes. These delicious little babies are made with glutinous rice flour, hence the chewy mochi-like texture. The mochi cupcake base is pretty straightforward and very versatile. 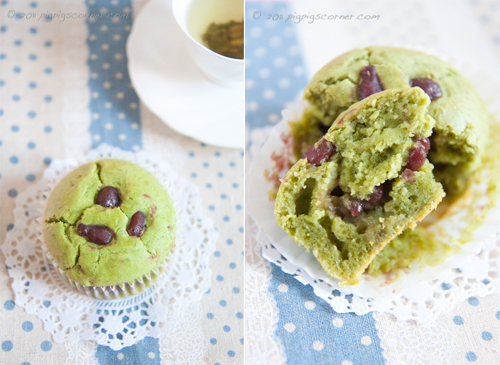 I planned to only make matcha mochi cupcakes with red bean filling since matcha paired with aduki beans seemed like the default flavour for Japanese desserts. I had some leftover butternut squash puree in the fridge, so I made some with it too and glad I did! I personally prefer the ones with butternut squash as they turned out more moist than the ones with red bean filling. These are extremely easy to make, so, if you think cupcakes are so 2009, try these cupcakes with a twist! They are not overly sweet and extremely addictive, so be warned! Line a 6 or 12 hole muffin pan with muffin cases, and set aside. Sift together glutinous rice flour, matcha powder and baking powder. Whisk eggs and sugar until light and fluffy. Fold in the melted butter into the egg/sugar mixture, followed by the evaporated milk. Fold in the sifted dry ingredients in two batches. Fill about 1/3 of the prepared muffin cases with mochi mixture. Spoon 1 tsp of red bean or butternut squash puree on the middle of the mochi mixture. Cover with more mochi mixture (make sure to only fill it to about 3/4 full, or it may overflow). Top with more red bean or butternut squash puree, this step is optional, it did this to differentiate the two different cupcakes. Bake for 20 minutes, or until a skewer inserted into the middle of a cupcake comes out clean. Best eaten fresh out of the oven. Preheat oven to 200˚C. Cut off stem of squash, then cut in half lengthwise. Scoop out and discard seeds from cavity of squash. Rub all surfaces with olive oil or butter. Lay the halves, cut side down on a baking sheet. Place in oven and roast squash for 45 minutes until tender. Allow squash to cool, then scoop flesh out from skin, and purée the flesh in a food processor. I cannot wait to make these! You've solved a riddle for me. I fell in love with mochi when I started visiting my dad in Hong Kong but once back in Canada I was only able to find these delectable morsels occasionally. And to think, I have all the ingredients for these in my pantry. Thank you! Thanks for the kind words on my blog, Christine! I'm so glad to have finally "met" you. I've actually been a silent subscriber of yours for quite a while and look forward to another year of your great posts! I love anything mochi-related as well as matcha-flavored so these are just the cakes for me! My thanks to both you and Ann for allowing us readers to enjoy such a great treat and photos! What a talented cook you are! This recipe combined my 2 favourite- green tea and mochi. Just out of curiosity, does it taste more like the Japanese mochi or Chinese mochi http://wp.me/p18zw1-As ? My two favourite ingredients...mochi and matcha!! can't wait to try this! I love the texture! They are such a lovely color and too. Not too sweet is fine with me. Great post, Ann! Love baked glutinous rice muffins, esp. when they are flavoured with matcha! They look so nice and I bet they must be delicious too. Wishing you and your family a Happy & Properous Rabbit Year! These look and sound so good, very unique for sure, I bet these cupcakes are just fantastic. Loving both the red bean paste and the butternut squash puree here too. Oh wow, that first paragraph is correct, I do feel like these were made just for me! As soon as I can get my hands on one ingredient I'm missing, I'm definitely making these! Excellent cupcakes...loved the combo of ingredients used ! I want to try and bake these for sure. Love mochi! Thanks for the recipe. Now I don't have to crack my head on what to prepare for my ladies' meet. 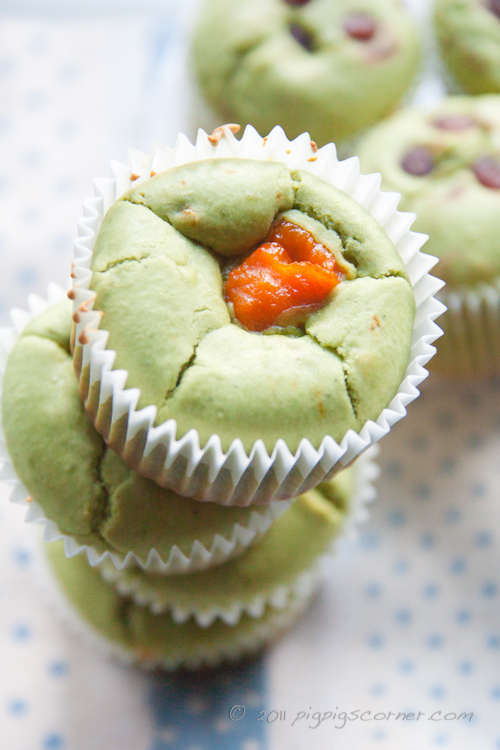 So, the ideas of green tea dessert + mochi cupcake make a great recipe : ). A very happy chinese new year to ann and christine! these mochi cupcakes looks awesome, i might like to try this some day too, i cant imagine how's this texture like cos the glutinuous flour sound interesting. They are very pretty to look at and yummy I bet too. I love the texture of this mochi cake. Made a chocolate read bean version but I love love love the simplicity with Matcha flavour. @Winkypedia Thank you =) It doesn't taste like mochi, it just has the slight chewy texture. This is definitely a very interesting cupcake. I must make it for my mochi-greentea-red bean crazed daughter! Thanks for sharing! These look delicious. I love the combination of green tea and butternut squash. Thank you to the both of you for sharing such a wonderful recipe. Those look so good for the health. I will make some of this for my grandparents. Thanks for sharing the recipe. The idea is so great! I better try this out to know what it really taste. Thanks for sharing. I added black sesame powder to the dough and the result is amazingly delicious! Thank you for another great recipe! Hi Christine and everyone! Is there something else I can put in the cupcakes besides the squash or the red bean? Actually, will they taste good without either? Please advise. Thank you. Baked this last night without fillings it turned out amazing!! Definitely a keeper.. Thanks so much. Hi there I made these and they taste great but I think the measurement for the green tea is wrong? Should it be 2.5 tablespoon instead? I used 2.5 teaspoon and there was no green tea taste or color at all. Different brands of green tea has different effects on colour and taste. Some brands will turn the end products into yellow instead of green too. Try to get the one that you're satisfied with. hi.. can i use steam? do the ingredients still remain the same? thankyou..
Am afraid the cupcakes are too moist if you steam them. Mine sadly came out dry. I used exactly what the recipe said except I did not put red bean or squash.